Discover Subbetica, one of the most beautiful parts of the Spanish countryside. Take in its breathtaking landscapes, explore its quaint villages, and enjoy easy access to important cultural centers. This area was a crossroads of Roman, Arab and Jewish history, as you will discover in its hearty cuisine and beautiful churches and mosques. Stay in a vacation rental apartment in the beautiful countryside of Andalusia. 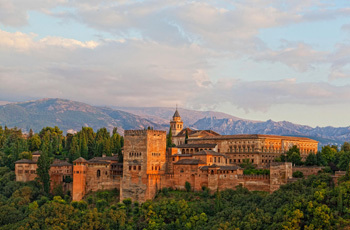 Day trip options: Cordoba, Seville, Granada, Malaga and other coastal towns, Alhambra, and more! Sightseeing: La Fuente de la Salud, the Roman ruins of Almedinilla, Cordoba's La Mezquita mosque, the Alhambra in Granada, La Fuente del Rey and much much more. Please note that if you plan on visiting the Alhambra, we strongly urge you to buy tickets as soon as possible as ticket sales are limited for each day. Click here to buy tickets up to 3 months in advance. Off-the-beaten-track treasures that can’t be beat: Track down the many sanctuaries of the Virgin in Subbética, taste tapas at the numerous bars scattered throughout the area, walk the streets of one of the white towns scattered throughout the region, meander through the olive groves – which for the most part are right outside your front door!